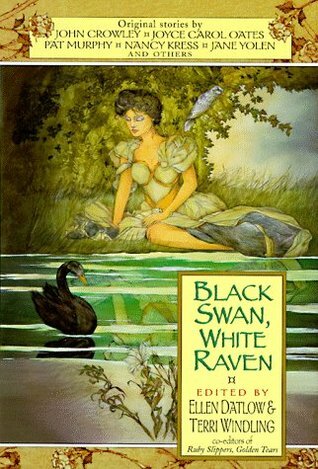 Black Swan, White Raven: Edited by Ellen Datlow & Terri Windling. Datlow, Ellen, & Windling, Terri. (1997). Black Swan, White Raven. Avon Books; New York. This enchanting compilation of fairy tales – 21 in all, with a mix of short stories and poems – contains the typical tropes and memes of the classic fairy tale in new and disruptive contexts. While some people have examined these tales with a critical eye, searching for hidden subtexts and framed meanings (e.g. feminism), I approached the book with the simple goal of enjoying a few well-written short stories. I was well satisfied in this regard. Photo credits to Ellen Datlow and Terri Windling 1997. I also appreciated that the book introduced me to each author; I enjoyed reading over their descriptive biographies at the beginning of each chapter. Not knowing my fairy tales that well, I was additionally pleased that each short story was preambled with a little bit of background on what specific fairy tales were involved. In some cases, the author took liberties combining several different fairy tales into one bold new tale. In all cases, the stories remind us that fairy tales do not always have a happy ending; dark and violent imagery permeates every tale in the book. If you’ve ever wondered what the fairy tales of our millennium will read like, this book is a good place to start your inquiry. Sometimes funny, sometimes sad, and always thought-provoking, Black Swan, White Raven is an excellent read for a dark and stormy night.